Like any animal, domestic birds are sensitive to summer heat and need to be observed more closely at this time of year. In fact, any extremes in temperature can send birds into shock as their highly-tuned bodies are adapted for consistent and temperate conditions. In cages and aviaries, birds can succumb to heat very quickly and exhibit signs of breathing difficulty and general malaise, anxiety and disorientation. You may also notice your bird extending its wings away from its body to keep cool. 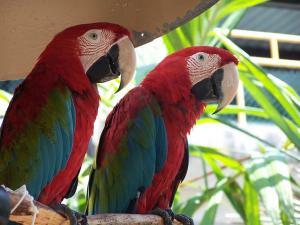 Warm birds may pace the bottom of their cage or aviary, fluffing their feathers and opening and closing their mouths. It is important to look out for these tell-tale signs that your bird is too hot and adjust its environment accordingly. If you have a garden or balcony, it can really help to move the cage outside to give your birds some fresh air (providing there is plenty of shade!) While it might not be the height of summer with intense sunshine, even slightly humid conditions are enough to cause dangerous overheating. If it gets too cold or breezy, bring your bird inside so it isn’t exposed to a draught, although moving air (from the breeze or a fan) can really help your birds cope better in the heat. Sudden and extreme temperature changes also have an impact on the immune system, weakening it and leaving your bird open to bacterial and viral infections. You should always ensure your birds have access to fresh, clean water to drink and bathe in, whatever the season, and ideally this should be replaced daily. This will encourage your bird to drink/use it and prevent it becoming stagnated or bacteria-ridden. VioVet stocks a great selection of drinkers and bird baths which are easily attached to the sides of cages. We also have a range of wild bird products, including bird baths and feeding tables. Misting bottles provide a great way of cooling down when used regularly around the cage or aviary and help birds to maintain their core body temperature. That said, they should never be sprayed directly at your birds as they will quickly develop an aversion to you and the spray. Finally, pay attention to your bird’s weight. If your bird is a bit on the heavy side, it is susceptible to the same problems as overweight humans – overheating, being one of them. The nature of a domestic bird’s captivity lends itself to weight gain, so it is important to always be aware of what you are feeding.